Unless you work in a physical job, chances are like most of us, you aren’t getting enough exercise or would benefit from more physical activity time. Our best pedal exerciser reviews takes a look at one passive way of getting more exercise throughout the day. What makes these devices different is that they’re most effective when we’re doing something else. Most exercise machines require our full attention, plus they’re often bulky and expensive. These leg exercise machines are much smaller and are most effectively used for long periods of time when we’re seated down. They best work in the background like when we’re working or watching television. Because they’re so easy to use and you can do them passively, we can easily spend upwards of 30 minutes a day on them with very little effort. And in doing so help us get healthier and lose weight. Best Cheap Pedal Exerciser: Small and inexpensive, this is the pedal version of the mini stepper. Instead of having the hydraulic piston and footpads, you get exercise bike pedals that are attached to a tension resistance. 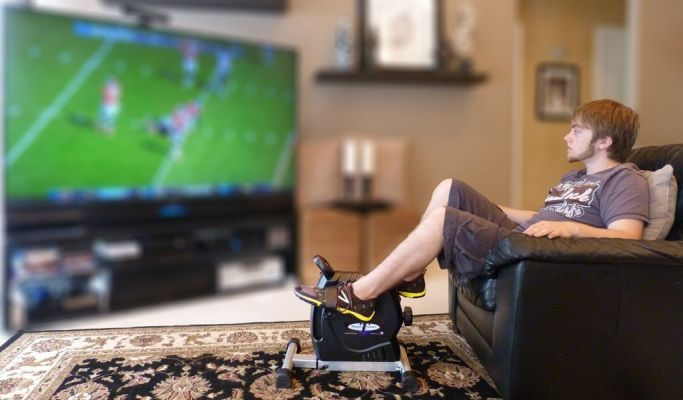 This is a great way to get extra exercise passively as you do something else like watch TV or read a book. The device is very easy to use and compact in size, measuring 14.7 inches by 12.5 inches by 6.5 inches. This makes it small enough to fit under the desk and lets you use it while at work, depending on how high your desk is. A tension screw located near the top of the device lets you adjust the tension level. On the opposite side of the screw is a small digital monitor that shows different readouts like total revolutions made and time spent pedaling. This pedal exercise comes already assembled which lets you start using it when you get the package. It also has the ability to fold up to a triangle shape to save on space when not being used. The DeskCycle is a step up from the basic pedaler as it uses similar mechanism internally as the bigger exercise bikes do. Instead of the small tension resistance, it offers magnetic resistance that allows you to adjust between 8 different difficulty settings. The magnetic resistance also means a smoother pedaling motion overall that’s quiet. Made specifically to be used while working at home or in the office, the device has a low height (10 inches) and the pedals don’t bring your legs up too high. This makes it fit under most tables. This is a great way to lose weight without even trying. As you are passively working out while doing something else. It can also be more effective that a regular 30 minute workout because you spend so much time seated down. Admittedly cycling while you work does feel a bit unnatural when you first try it. But after a while, when you’ve gotten used to is, the motion becomes second nature. Unique in our best pedal exerciser reviews is this motorized unit. Unlike the others, this comes with a built in motor. You can choose to workout with or without the motor. The presence of the motor allows the pedals to move like an assist. This makes it ideal for those who are recovering from injury or surgery, or want something that helps strengthen the muscles. It also helps those with neuromuscular disorders as well as anyone rehabbing since the machines helps you move your muscles and promote blood circulation. For exercise and burning calories, you can choose to turn the motor on or, turn if off for a more challenging cardio workout. You can likewise use it for your arms as well. This is a great assist machine for clinical purposes that allows people to do physical therapy at home. At the same time it lets you exercise as you are seated down reading a magazine or watching television. This is a heavier duty model of the pedal exerciser at the top of our reviews. It comes with a more solid construction and what it calls its Cool-Rev technology. Simply put, it does not heat up as much as the more basic pedalers. One of the problems of many cheap pedal exercise devices is that they have a slim frame and the tension resistance starts to heat up after you’ve been pedaling for a while. In some models, they can overheat. This one addresses both those issues. Like many of the machines listed in our review here, this works well under the desk while you work. However, it isn’t ideal if you’re 5’11 or taller, or if you have long legs as your knees will bump the bottom of your table at the peak height when your pedal. Similarly designed as the DeskCycle, this mini exercise bike uses magnetic resistance to let you get a smooth pedal motion. It is very quiet and comes with different levels of resistance as well as the digital monitor that tracks your session. What makes this different from the DeskCycle is that it is bigger. The design is taller and slimmer compared the the shorter DeskCycle. It is made this way because it caters to those who prefer to be able to get a fuller pedaling range of motion. The compromise is that it doesn’t fit in lower tables. Instead, you’ll need at least 33 inches of clearance under your table to use this for that purpose. You can however use it away from the desk and benefit for the larger revolutions your legs make. The device also allows you to pedal forward as well as in reverse so you get the different muscles in your legs working. It likewise has a wide 15 inch base to make it very stable during use.